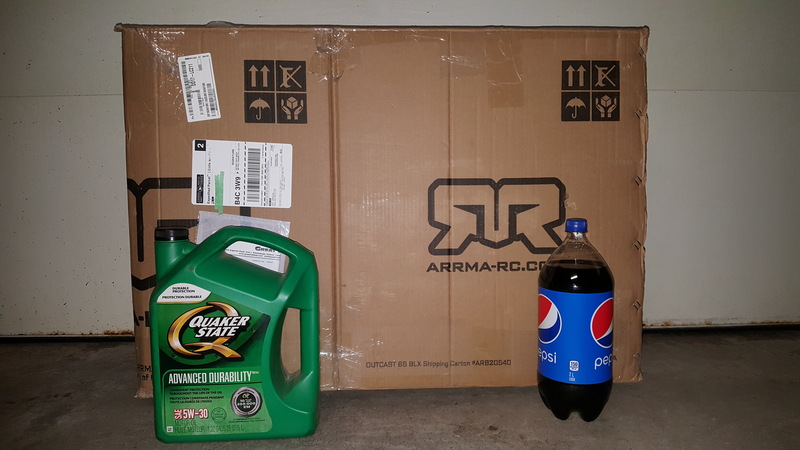 A 5L jug of oil and a 2L bottle of pop show the size of the box. Canada Post stopped by the house today with a delivery. I looked at the box and I immediately became concerned and thought to myself “Oh crap there has been a mistake.” My next thought was “Who pays for return shipping?” because I know that won’t be cheap. This leads me to my question for you. What is in the box? It is the new 8s version of the Traxxas X-Maxx. I had been looking at the original version for a little bit and when I heard there was a updated version coming out, I jumped at the chance. The updated version includes the VXL- 8s ESC, additional fans keep the motor and ESC running cooler, the following parts are upgrades: Wheelie Bar, Differential Ring Gear, Front and Rear Differential Pinion Gear. If you have the previous 6s version, you can find all of the upgrades in the Traxxas 8s Power Up Kit. The motor which is not included in the Power up kit is now 1275kv instead of the original 1600kv. This switch should also help keep temperatures down. I’ll be back soon with my thoughts and impressions.